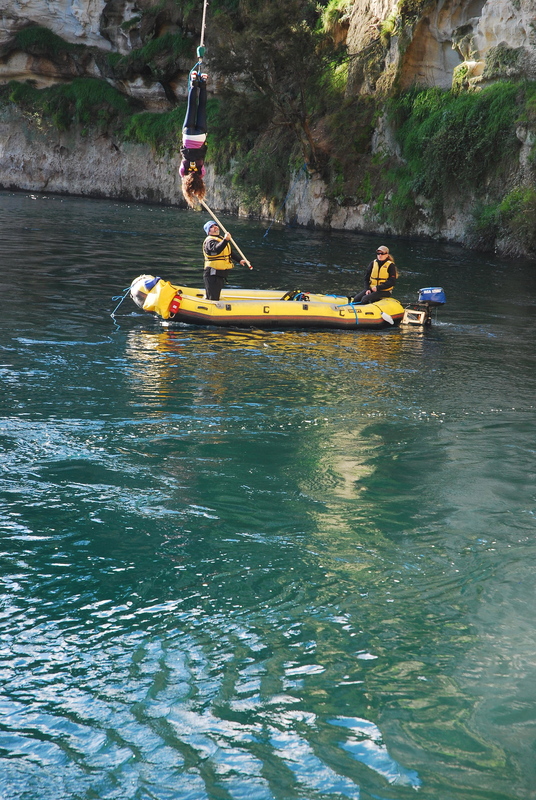 Those were the last words we heard before we plummeted full speed from a 47 meter platform towards the lake beneath us. 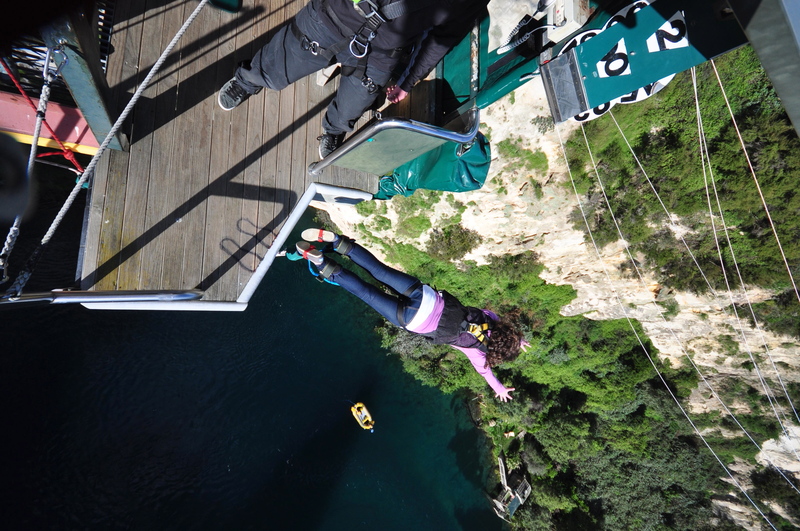 We jumped at Taupo Bungy to get our adrenaline fix…for the day. Coley’s Jump: From a distant glance, the jump off point didn’t look so intimidating, but when I got harnessed up and ready to jump…I looked down. I even contemplated turning back, but the person who jumped before me was a ten-year-old boy, so I would have felt pretty lame doing so. I would have never guessed that I would be bungy jumping, considering I close my eyes on rollercoaster rides at Six Flags. 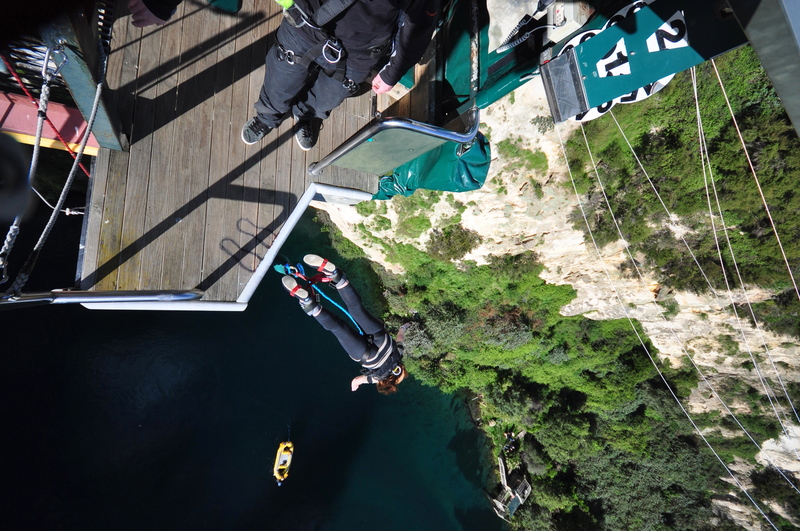 But hey, when’s the next time I’ll be in Taupo at bungy jump central? After being strapped in, clicked in, and locked in tight, I made my way to the platform in what could be described as a penguin waddle. Not because I was scared (maybe a little) but because the ankle straps restricted the range of motion for walking. I lined up on the edge, gave a careless wave to the camera, and dove off the platform. The free fall feeling was the scariest part of the jump, but once I felt tension in the bungy, all was good. The view was incredible and the feeling was exhilarating. Kim’s Jump: Being the adrenaline junkie that I am, bungy jumping was one of the activities that I was most excited to cross off my bucket list this summer. Since I practically grew up riding roller coasters at Cedar Point and went skydiving in Australia two years ago, I thought this would be no big deal. I’d say the most frightening part of the entire experience was the anticipation of standing on the platform waiting. Coley decided she wanted to jump first so I had the amusement of watching my best friend jump off the edge minutes before my turn. Coley was gone, and I was next. I carefully watched the jumpmasters check the bungy cord (twice) and made my way to the edge. This was it…the moment I had been anxiously awaiting for years. I smiled at the camera, bent my knees, and soared. I didn’t want to bungy jump in complete silence, so I started to yell with excitement before my feet even left the edge. However, the speed of the freefall left me speechless, and I couldn’t even get a noise out until I was swinging back and forth between the cliffs. I was surprised that the tug of the bungy cord didn’t hurt, as I hardly even felt it. All I can remember after that was a lot of flying and spinning. I was actually quite disoriented by the time it was all over. I will admit, the freefall of bungy jumping was much more thrilling and frightening than skydiving. Despite the fact that I was much closer to the ground, I didn’t have a professional on my back this time. Ultimately, it was a complete rush and I would do it again in a heartbeat. Check back soon for video footage from this adrenaline pumping event. Posted on June 26, 2011, in Destinations, New Zealand and tagged Adventure, backpacking, bungy jumping, Coley Nelson, jumping, Kim Pitingolo, Magic Bus NZ, new zealand, taupo, taupo bungy, Travel. Bookmark the permalink. Leave a comment.